I got a new love seat last night. 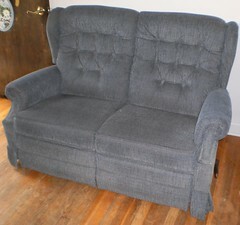 Pam and Don, dear friends, are getting new furniture for their family room. 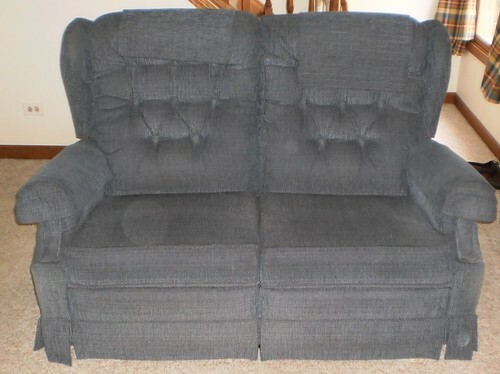 Pam asked if I might be interested in taking one of her love seats. 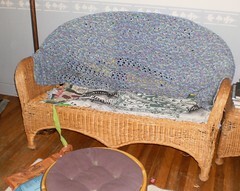 I realized that the wicker settee is, easily, 10 years old, maybe close to 11. I don't remember if I bought it in the spring of 2000 or 2001. There's no way I'm going to afford new furniture now and the love seat they were offering was in exceptionally good condition. Now to get it to my house. Fortunately, the back comes off. I need to mention, these are recliners. Yes. Both sides recline. It's very solidly built, on a steel frame, and I wondered how we'd get it in the front door. No way were we taking it around back, lifting it over the kitchen sink and table, making the turn and finally putting it against the wall in the living room. When Pam showed me that the backs come off, well, getting it in the front door would be a piece of cake, other than we're all a bit older than we were before with bum legs and knees and backs. My settee has been a great addition to the house. I know we didn't tie it to the top of the Jeep so we must have used the station wagon Carole had for awhile to get it. I think it was from Pier 1. Seven different cats have slept on it. It's been sturdy enough to handle three high school kids. The original seat cushion suffered an accident and had to be tossed. My friend, Laurie, made the crochet blanket unaware that the colors she chose would match the living room perfectly. I had three lap throws folded and acting as a minor cushion. I moved it and swept. All the rugs and the ottoman were pushed over by the TV and I moved the settee to the basement. It might be nice on the deck but would it survive summer and winter, even if I covered it? Right now, I'm unsure what I will do with it. It's still got quite a bit of life in it. Had Pam and Don not decided to get new furniture (from JC Penney, no less), I'd be quite happy with this. 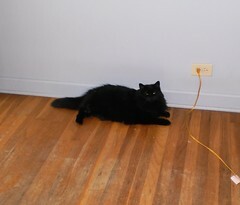 As soon as I got the space cleared, it was claimed. Moving the love seat wasn't as problematic as it could have been. After taking off the backs, we put the seat on a canvas painter's cloth and dragged/shoved it to the garage door. Then we stood it on end and gently "walked" it to the back of Pam and Don's van. We tipped it onto a blanket and then lifted, dragged and shoved it into the back of the van. Once we got to my house, it was pulled from the van onto a dolly. That was pulled up to the front steps and we lifted it up the four steps to the top. That was the hardest part. Pam and I are not working with the best of knees. It was a bit heavy. At the top of the steps, it was put back onto the blanket, lifted over the threshold and dragged into the proper place in the house. Mija and Pilchard know Pam's voice. She walked over to Pilchard, who was sitting on her usual container in the living room and said, "Hello." Pilchard responded back at her. Mija watched from the hallway not quite sure why both of us were in the house at the same time. When we dragged the love seat into the living room, Pilchard took off. Pam was a bit worried that one of them was out but Pilchard was in the office and Mija was in the closet in my bedroom. It fits nicely in the spot formerly occupied by the settee. The color compliments my living room decor very nicely. Yes, I have used it and reclined to finish reading the book I was working on. I'll probably find that's it's also a good place for a nap. Pilchard agrees. She claimed it about 2 hours after getting used to it being here. Pam and Don have a dog and although Kasey isn't allowed on the furniture, her scent has to be somewhere on the settee. It is, however, now a part of our life. 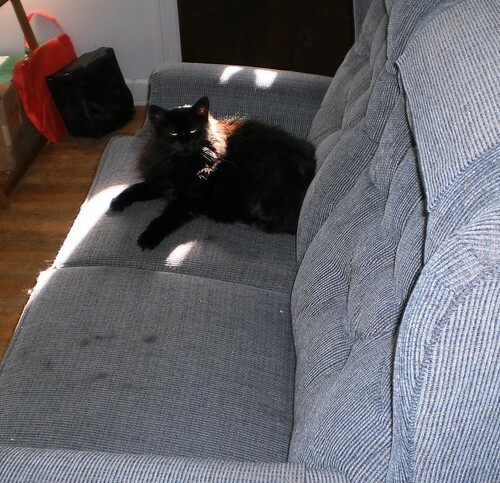 Notice the black fur on the seat. I need to decide what throw I'm going to put over this to sort of contain the fur. This is a stamp of approval.